It started with a Google search, and a conversation with a barista. 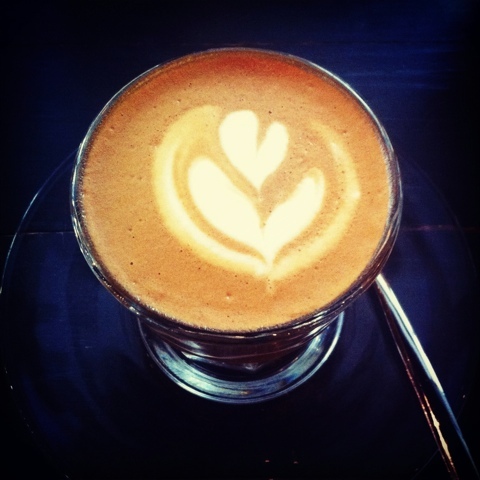 I was looking for quality espresso shots in Singapore, having just moved from Hong Kong. He came back with one recommendation - just one - not because of a lack of quality coffee, but because one cafe stood out from the others. With a series of wins in the Singapore barista championship, an annual latte art throwdown and a coffee roastery and retail business, Oriole is an established part of the Singapore coffee scene. It's also one cafe that I go back to on a regular basis. 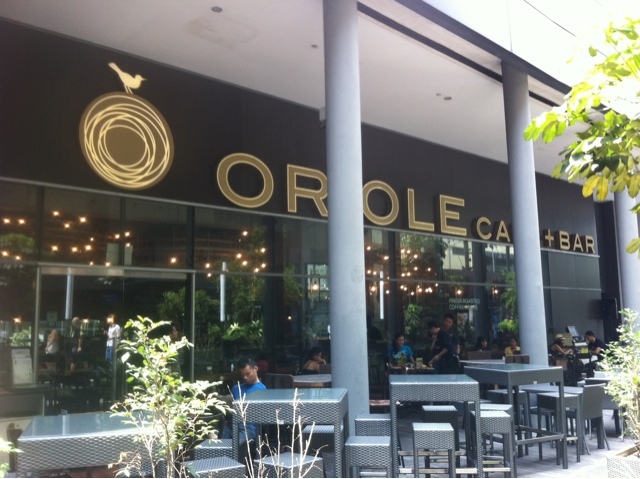 Starting with a flagship cafe, bar and restaurant in 313 Somerset, Oriole has expended to include a new roastery in Chinatown (Jiak Chuan road) and a cafe in Republic Plaza. The espresso shot below had a golden brown crema, consistent with coffee beans which have been roasted recently - exactly what I would expect from an established coffee roastery. Inhaling deeply, I could identify a very distinct, almost floral aroma, and no burnt or charred notes. The initial impression was of citrusy and berry-like flavours, which were neither too tart nor astringent. 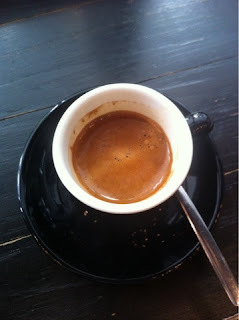 This was complemented by a slightly viscous, syrupy mouthfeel, and the correct volume for an espresso shot. Each of the elements of a good shot were there, combining to create a shot that was so much more than a combination of ground beans and steam. There are also some interesting combinations of caffeine and milk happening above Somerset station. The espresso shot above was paired with silky smooth microbubbles, resulting in a balanced drink, but a cappuccino which retained it's potency. The aftertaste lingered, with sweetness evident in the foam - this occurs when milk is steamed at the correct temperature, increasing the solubility of the lactose. 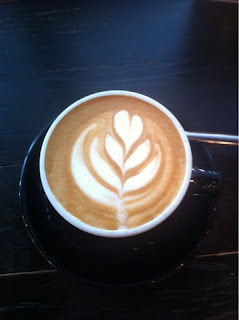 Unlike a lot of cafe's, I could also taste the citrus notes in the milk, a nice touch that I don't always see. Piccolo latte's are also a speciality in Oriole - I've mentioned them before in a previous post. 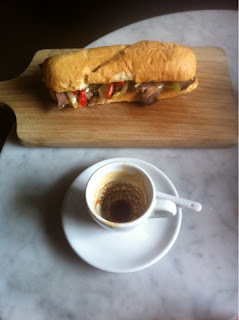 The piccolo below was beautiful - built upon a foundation of a double ristretto, with potency tempered by smooth foam. Ristretto on the menu is always a good sign - think of it as an even more intense espresso, consisting of the first 10 seconds of extraction, unlike a regular espresso shot which extracts for 18 - 30 seconds. For coffee lovers, the presence of ristretto on the menu is a subtle indication that the level of coffee knowledge on the part of the staff is higher than average - it suggests an understanding of the effect of different extraction times for a shot. has a better selection of coffee retail items (also, the quality of drinks in the Republic plaza venue can be inconsistent at times). Although this is not a food blog, the sticky toffee pudding at 313 Somerset deserves a mention. It's a combination of a warm, dense pudding paired with a sweet caramel glaze and cold ice cream - absolutely something that should be tried. Friendships have nearly ended fighting over the last bit. 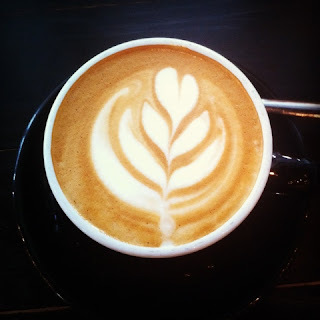 Over the course of multiple visits to 313 Somerset and Jiak Chuan, I've had consistently good coffee, and some well crafted shots - years later, my barista friends recommendation still holds up. Both are worth visiting, and deserve their reputations for quality coffee.